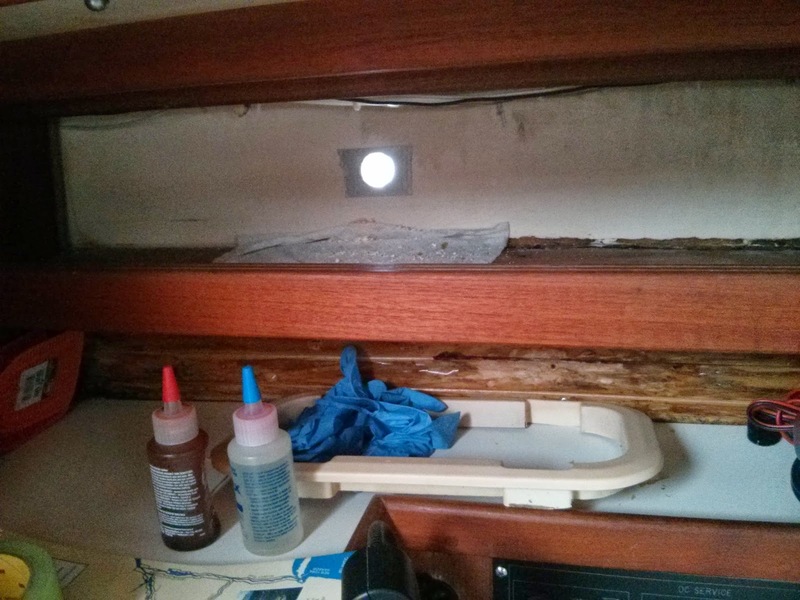 A marine head (toilet) really does affect a boat's comfort and enjoyment. At home you rarely have to think about a toilet because it just works. If it doesn't, the only tool needed most of the time is a plunger. On a boat, few of us have a backup, excluding going over the side or using a bucket, and a bucket isn't suitable for many. It's also much harder to unplug a clogged marine head. You don't see plungers on boats as they don't work on a marine head. Usually dis-assembly is required to undo a clog. Then there's the fact that the parts of a marine head have a finite life span before rebuild is required. In 2010 the original Jabsco head on Donnybrook, my 1990 Catalina 34, was nearing the end of it's useful life. A rebuild kit was nearly the cost of a new toilet so we started looking at new heads. At the time our oldest son was newly potty trained, but wasn't strong enough to use the hand pump to flush. In his defense, some of our guests had problems with the head, too. After some discussion, we decided to invest in an electric flush head. A friend's positive experience on another boat made the decision easier. It wasn't inexpensive (the head alone was $400+ in 2011, new hose was $100+), but over the past 3 seasons it truly has made the boat much more comfortable and enjoyable. Installation was easier than expected. Operation has been trouble free. The only problem in 3+ seasons was when a guest deposited a wet wipe. I was able to clear it in about a minute. Bowl Size: I thought a "household" size bowl would be a nice feature. I measured available space and pondered dimensions, but settled on the compact bowl because that is what I already had. In the end the household bowl probably would have fit, however it would have made the space more crowded and cleaning behind it would have been more difficult. Fresh Water or Sea Water: Most articles I read regarding the SeaEra stated the fresh water model was quieter and used less water to flush. Low water use is important because it doesn't fill the holding tank as fast. Noise was an important consideration so I went with the fresh water model. I'm happy with the decision. The installation instructions from Raritan (link will prompt you to download a PDF file) were straight forward. I completed the head install with a friend in under 4 hours, including a trip to a hardware store. The pump-out and vent hose replacement, including thru-hull install, was another 3-4 hours. Installation included an atmospheric vacuum breaker and a solenoid valve. I connected the two with a short threaded pipe so I only had to worry about mounting one piece. I mounted this directly behind the head accessible through the cabinet door. I inserted the water "T" in the cold water line under the head sink and added a ball valve in case I ever need to shut of water to the head. I borrowed power from the shower sump pump under the sink. The wire is the proper gauge for the length of run and current draw and the existing breaker was already the correct size. I replaced all the hoses in two phases, starting with the hose from the head to tank. I used Trident Sani Shield hose. Removal was easiest by cutting it, using a hack saw as it's wire reinforced. It wasn't as messy or smelly as I feared. I think it helped that I did this project it on a cool spring day. This spring (three years later) I replaced the pump-out hose with Sani Shield hose. To remove the old I cut it about a foot from the tank inlet and used an old indoor/outdoor vacuum to finish emptying the tank. There was only a gallon or two of liquid left in the tank, including RV anti-freeze from winterizing the head and tank, but this step kept me from spilling anything in the bilge. I replaced the vent hose using Trident XHD 1" hose. I added a new through-hull just aft of the existing vent outlet (through the stanchion) using a Forespar Marelon 1" mushroom thru-hull fitting with 90 degree elbow. Pulling the new hose was easy by taping it to the old hose and pulling it through. The addition of the electric head has made Donnybrook a more comfortable boat for my family and guests. It reduced the complexity of something that should not be complex, reduced noise, has been very reliable, and is an upgrade I have no regrets about doing. This year I'm trying something different and sailing the Mac on a friend's boat, Talisman, a Tartan T-10 (pictured). You can track me here. Look for the T-10 group (section) and the boat Talisman. Sailing the race on Talisman will be a lot different than Donnybrook. Donnybrook was built for comfort. Talisman for competitive buoy racing. Buoy racing by nature doesn't have an overnight component so accommodations are sparse to say the least. The Mac will be 50-60 hours. 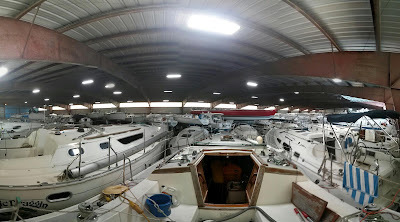 Living on a boat like Talisman during the race has been compared to primitive camping--there's barely a camping stove compared to Donnybrook's stove and oven. Where Donnybrook's race menu emphasizes enjoyment, Talisman's is about subsistence and limiting bathroom usage. The real difference, however, is in the racing. The T-10 fleet is a one design fleet meaning all boats have the same specifications. Some off the best sailors on Lake Michigan are in the fleet. There's no handicapping. 20+ other boats will start with us and we expect to sail neck and neck with some of them for 333 miles. The boat that finished first wins. The return trip will be different, too. Karen and the boys are still meeting me on the island, however I'm driving back with them. My goal is to show them some of the fantastic places I visit via Donnybrook and get them excited about an extended cruise next year. I'm really looking forward to the change. Look for more articles describing differences here, and follow me on Facebook and Twitter. I was reminded that this is my tenth season with Donnybrook Sunday morning while getting dressed. The t-shirt I was putting on was made for my first season with Donnybrook. The shirt idea came at a bar. I was sitting at my then favorite bar, Joe's on Broadway, with two good friends when we decided to have shirts made. We had nicknames printed on the back of each. My friend, Todd, still wears his whenever he visits even though the name on the back of his shirt is "puke"--because he gets seasick in a bathtub but still sails with me. I remember the October day Karen and I looked at Donnybrook for the first time. We'd looked at several other boats but none felt right. Karen a I climbed aboard her and we knew immediately she would be ours. A few weeks later we owned her and the next spring we were sailing her on Lake Michigan. After 10 years I still enjoy her as much as the first year. I still look forward to seeing her after work. I can't wait to spend the weekend with her and I feel sad to leave her after spending all weekend together. Time away is sometimes nice, but eventually I want to go back to her. She's a stable part of our family. It seems like a lot would change in ten years, and it has. Surprisingly a lot has remained the same. We live at the same address. Many of our neighbors are still the same. We work for the same companies. Our jobs may have changed or our offices might be on on different floors, but our paychecks come from the same place. We still have many of the same friends we did in 2003. The biggest change? Our immediate family of 2 (with a cat) is now a family of 4 (without a cat). The trees are taller, appliances newer, and paint fresher at hour home. We've moved farther apart from some friends and closer to others. We drive a newer car. I don't mind as much getting up early and enjoy going to bed early. In the end, ten years of owning Donnybrook doesn't really feel like a milestone, rather another point on the boat ownership journey. The area around Crowley's, where Donnybrook is kept in the off season, is fascinating if you like ships, bridges, trains, and the like! In 2011 Chicago was ranked 36th in the United States in total trade with over 19 million tons of freight passing through. This surpasses ocean ports such as Jacksonville, Florida and Oakland, California. A lot more ships than most realize visit Chicago. The Michipicoten is a 695 foot Canadian flagged bulk carrier. She was being helped by a tug up the river. It took several minutes to pass under the 95th street bridge, where this picture was taken. A few hours after the Michipicoten passed, we saw this tug/barge combo heading to Lake Michigan. The 95th Street bridge is up allowing her to pass. The barge is the Integrity. The tug, pushing her, is a separate vessel called the G.L. Ostrander. The FleetMon app installed on my smartphone showed her destination to be Green Bay with an ETA in just 16 hours. A few weeks ago Carlos and I spied the Fuldaborg, a Dutch freighter, at Iroquois Landing near where Lake Michigan and the Calumet River meet. 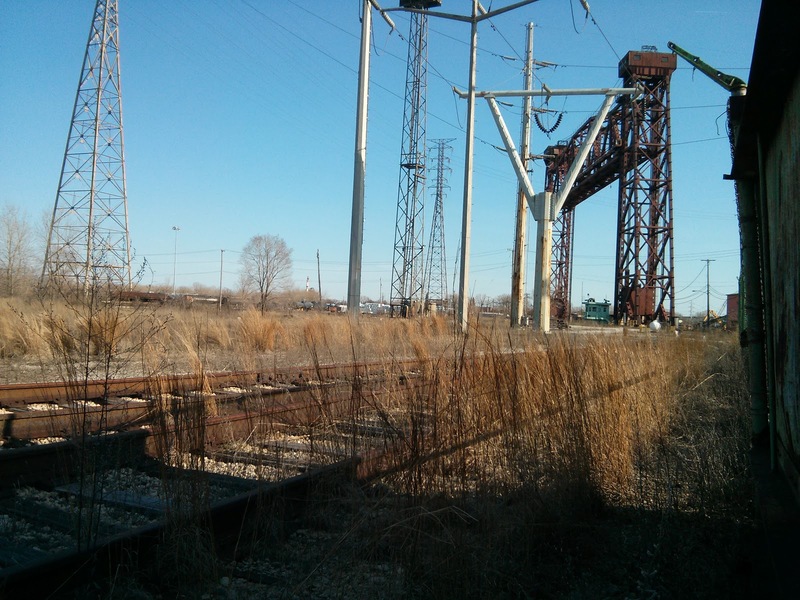 The tracks lead to this lift bridge and serves the former US Steel South Works site. The bridge is up most of the time, however Donnybrook had to wait for this bridge as recently as 2 or 3 years ago while a switching train engine passed. 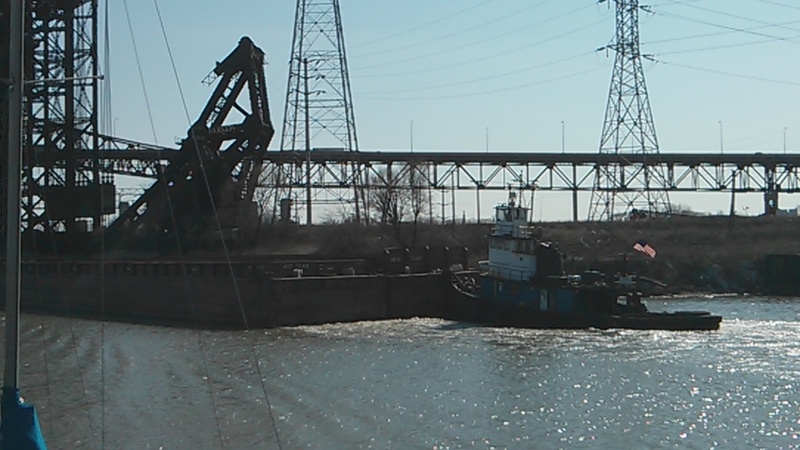 There is plenty of barge traffic on the Calumet river. This tug is pushing a handful of barges up river. 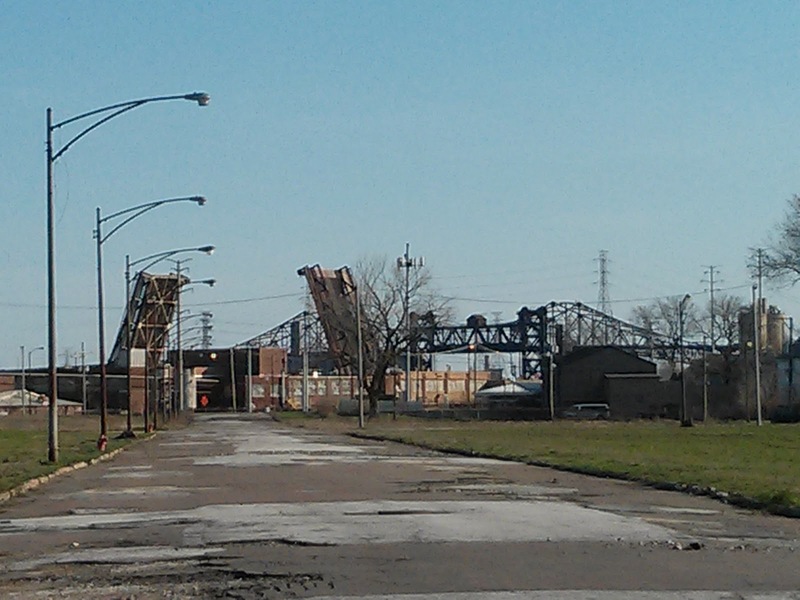 The Chicago Skyway bridge is in the background with part of a railroad lift bridge to the left. This shows how low the lift bridge is. 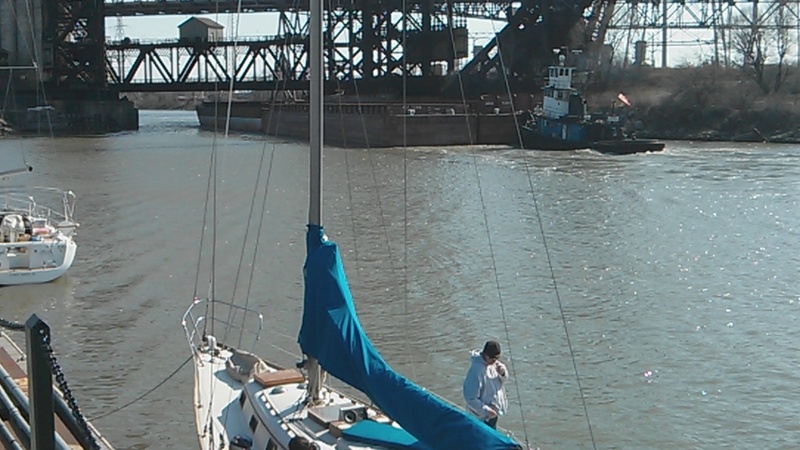 The tug had to stop in a hurry as it appeared to be expecting the lift bridge to be up. 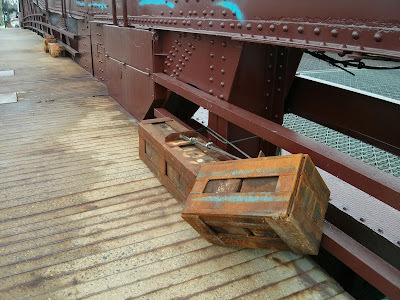 Mike noticed these odd looking weights chained to the bridge They were on booth leafs on both sides of the bridge. We theorized they are there to balance the bridge and necessary as part of recent bridge work. The final picture shows the relationship between the bridges. The raised drawbridge is the Ewing Avenue bridge, currently up for repairs. To the left, out of the camera's view, is the US Steel lift bridge. 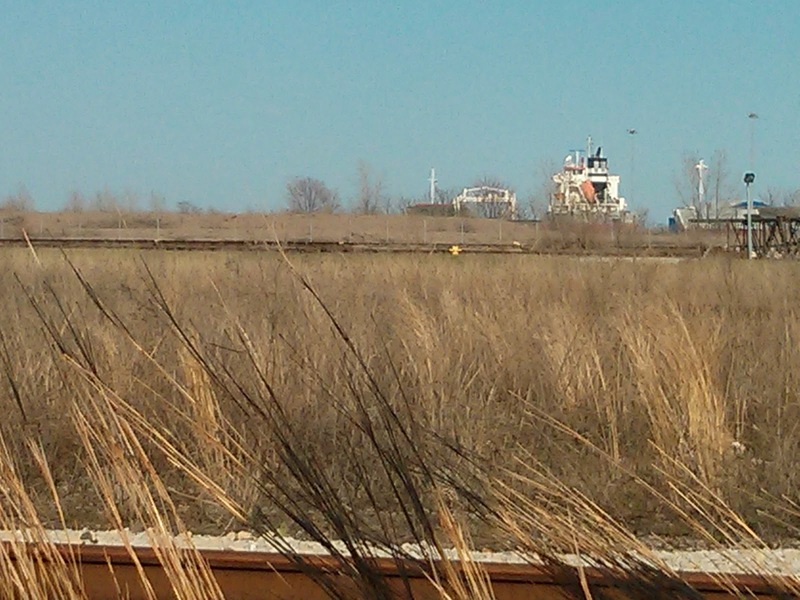 To the right (not visible, before the rail lift bridge) is the 95th Street bridge. Behind the lift bridge is the Chicago Skyway bridge. You can read more about the bridges in the Encyclopedia of Chicago: Calumet River Bridges and Great Lakes Shipping at the Boatnerd site. As I wrote A few weeks ago in Filthy Boat, the emotions are mixed this time of year. Mike, Kevin, and I made a lot of progress getting rid of the filthy boat blues. A few hours scrubbing the topsides and hull and a few more hours waxing made a world of difference. Thanks to Kevin and Mike for their help last weekend and Carlos two weekends ago. 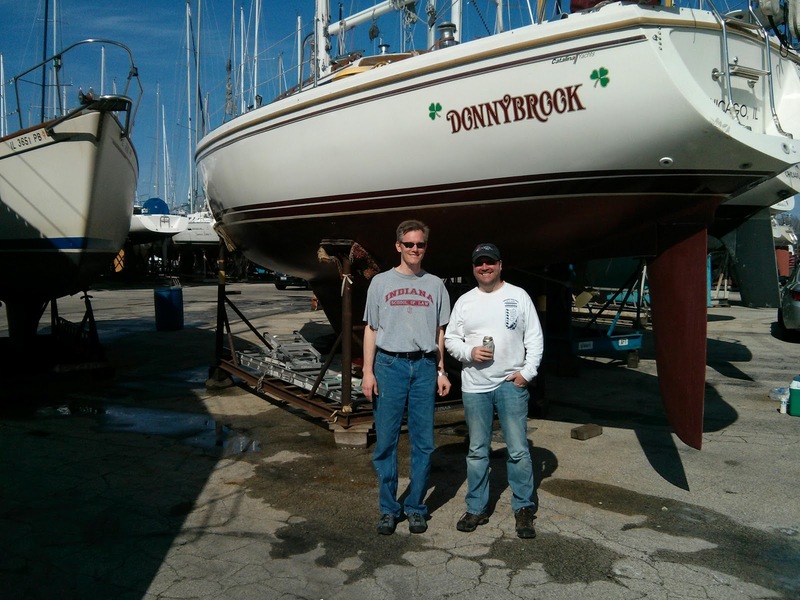 Donnybrook is in the water with a clean and waxed hull. The topsides are mostly clean and need some more wax (Mike did a lot Saturday). Down below needs the most work and is the target of today's work. 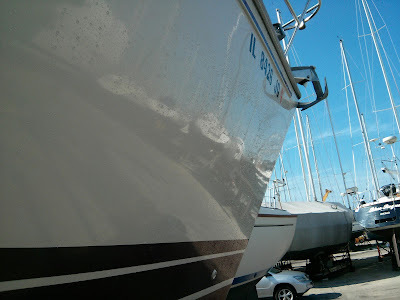 By the end of this weekend I'll be enjoying clean boat joy back in Belmont! I've recently discovered pictures from space on the internet. Here's a picture of the Great Lakes taken on a cloudless September day. This puts sailing the length of Lake Michigan, from Chicago to Mackinac Island non-stop into perspective. Our piece of the world is amazing, isn't it? The emotion is similar every spring, alternating between "I wish I could launch today! The lake is flat and I'd love to be back at Belmont Harbor" and " The boat is so filthy. It'll never clean up. It'll be in the yard until June before she's ready." The reality is somewhere in between. I don't have any critical projects this spring. A coat of wax on the hull and bottom paint touch-up are all that's required. The more cleaning and other projects I do at Crowley's, the fewer I do at Belmont. April and May weekends are mostly full with family commitments so I'll really need to prioritize my work. A filthy boat at the harbor is better than a clean boat in the yard, after all!